There are certain apps we have been using on a daily basis since we started our location independent lifestyle and we realise that we would be pretty lost (sometimes literally!) without them. Google Maps is an amazing resource to have when you are in an unfamiliar city and need to know how to get around. The app tells you which modes of transport are available to get to places, what time they come and how long the journey will take. It includes getting to places on foot as well so you can then compare and work out if you want to take a bus/tram /train/drive or walk. I would definitely have been lost many many times without the app and am amazed at how accurate it is. It means I don’t have to wait for ages at a bus stop hoping it will come soon because Google Maps knows what time the next one is due. You can use it to find nearby cafes, restaurants, banks, post offices etc. Handy for when your little one needs to use the toilet and you have no idea where to go. Another reason I love the app is because of the little blue arrow. I am “navigationally challenged” and find it difficult to orient myself at the best of times (even in familiar cities!). Google Maps pops a little blue arrow on you so you can see which way you need to face in order to follow the route. I know this may seem like a stupid thing to love about the app but it’s probably the most important feature for me! The app is free to download, has a very simple to use interface and is very responsive. (NB – you need to have access to the internet in order to use the app). This app was recommended to us by other nomadic families. It’s an app which you can use to help you budget your daily spend. You just log the things you’ve spent money on each day into the app. It comes with some pre-set categories (food, transport etc.) but you can easily add other categories to make it more personal to your needs. For example, we have a category called ‘worldschooling’ so we can see how much we spend on classes/activities for our daughter. You can use the app to set a daily budget and it will let you know if you have exceeded or stuck within the amount you wanted. It also has a character that makes encouraging or discouraging remarks depending on how you are doing that day! For example, “Over budget, no cookie for you”. The great thing about the app is that it has an automatic currency converter built in so if I spend 300 Czech crowns on my groceries I have it set to tell me that is the equivalent to £10. This makes it so much easier for me to get to grips with the actual cost of things. The app is free but only really as a test. It lets you log 25 items but then you have to pay to be able to log any more items. Still, at $4.99 (USD) we think it is worth it. This is a godsend when you don’t have a decent grasp of the local lingo. 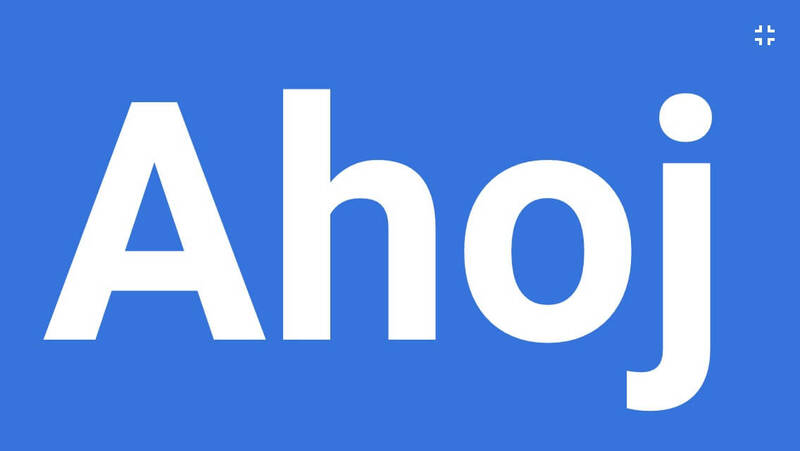 We accept that Google Translate is definitely not 100% foolproof (when we were learning Spanish in Valencia we found a few words had quite different meanings to what Google translate gave us). However for getting around and basics it is amazing. We have used it pretty much daily when deliberating over a non-English menu, or trying to ask someone for directions etc. It is easy to use – you just type in the word you’re looking for in English and select the language of the place you are in and it gives you the word(s). We particularly like 2 features of the app. 1) If you turn your phone sideways when you have the word you need then it shows the word in huge letters on the entire screen. This has been really helpful when we’ve been trying desperately to pronounce the words ourselves but aren’t making ourselves understood. You can just turn the screen sideways and show the person you’re talking to what you mean! 2) We LOVE the camera feature. You can use your camera on your device and point it at the text you want to translate. It will then focus in on the words and automatically translate the text for you. (You do need to download the language file first for this to work). We pretty much always use this for menus and signs we don’t understand. It’s a brilliant piece of technology and whilst again it isn’t perfect (It once said there was “home dumplings and potato violins” on the menu!) it usually gives us the gist. Here is an example of the camera translation feature. 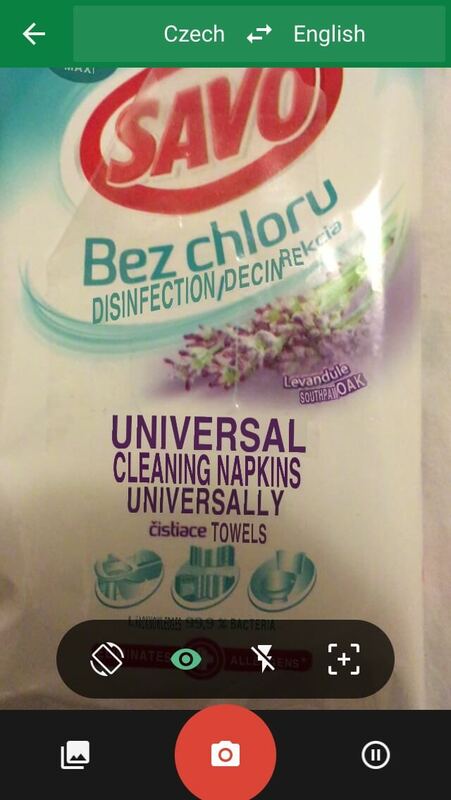 This is a pack of cleaning wipes which is from the Czech Republic. As you can see the translation may not be 100% perfect but it helps us understand enough to know what we are buying! This handy app allows you to convert currencies to their up to date exchange rate. You can select as many currencies as you want to view and it displays them in a list for you. It’s very simple to use. The other feature we like about the app is that it has other converters as well – so if you need to convert kilograms to pounds or mph to kph it can also do that. It also has a great “tip calculator” so if you want to work out what 15% of a bill is you can type in what the total is and it will work it out for you! It does have ads running on the bottom of the screen but we find they are not too intrusive. Dropbox – a way for us to store documents and photos online. Uber – for when you need a taxi. WiFimap – an app that finds free wifi connections locally. Are there any apps you have that you can’t travel without? Note: In this article, all opinions are our own and we are in no way affiliated or paid by these apps! HOW do you travel as a family? Google translate is one of my favorites, great list! Great list. We use Google Translate every day – such a great app. We also love trip it. It keeps track of all air and hotel reservations. It’s great when you are traveling to multiple cities. Ooh Tripit looks good! Thanks for the tip. Google Translate was a life saver in Tokyo!! Great list! We are getting ready for some long term traveling and I can definitely see how we could use these! Google products really are wonderful. I’m excited to use Google Translate on my next international trip. Oh, and a great travel site by Google is Flights.google.com. Awesome resource! we use Triposo for its off-line maps. You download the country or city guide for wherever you’re heading when you have wifi then it works like Google Maps (including the little blue directional arrow) when you’re there, except you don’t need an internet connection. Includes local transportation (Metro etc.) maps too. TripAdvisor for Things To Do, places to stay, restaurants to try etc. Thanks for the tip – will check out Triposo, that arrow is my lifeline! We just discovered TripIt and it has taken my travel day stress levels right down! Love it. We also use TunnelBear and it has been great so far. Thanks for sharing! Hubby and I are planning our year long adventure trip now!